Ross was struggling to commit to making the leap to full time freelancer. He knew he wanted it. Believed he could manage it. But kept pushing his own deadline to make the leap out further. Then fate (and the Canadian government) stepped in and decided for him. 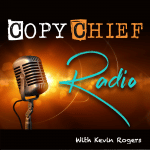 Today on Copy Chief Radio, Ross O’Lochlainn raps about all the Dragons we face on the epic journey to freelancer success. Today Ross is partnering with three high-level online learning companies (Copy Chief is fortunate to be one of them) to direct their marketing campaigns and earning mid six-figure revenue in the process. A long way from holding on desperately to his worker bee status and very average pay just over two years ago. Whether you’re just mustering the courage to cut the cord and go full time with freelancing, or you’ve been chugging along this way for years, I promise this episode will fire you up for hitting that next level.